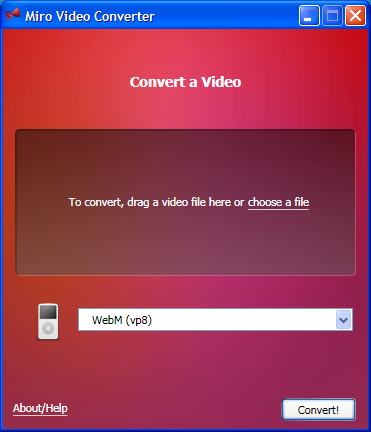 Miro Video Converter, a useful open source tool for converting videos to several kinds of formats – including Ogg Theora was released a two months ago together with overhauled Miro 3. Today the development team has released Miro Video Converter 2.0, with support for Google’s new open WebM (vp8) video format, so users can quietly convert almost any video to MP4, WebM (vp8), Ogg Theora, or for the Android and iPhone. Miro developers believe that “WebM can help us all escape from the traps of closed, patented video formats”. Miro Video Converter 2.0 boast improved audio and video quality on conversions, more conversions options and support for new devices, including the iPad. It also remembers your last selected format and can send apple conversions directly to iTunes. Miro Video Converter is a 100% free download for Mac and Windows. No Linux builds are available right now.